Historically, the preferred field of view for Pyrheliometers was based on a 10:1 ratio which equated to approximately 5.7°. 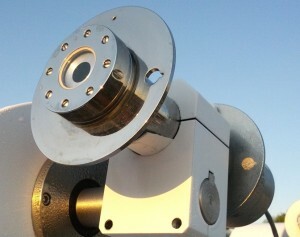 Due in part to the commercialization of the Eppley AHF Cavity Radiometer as a Primary Standard and advances in accuracy of Automatic Solar Trackers (such as the Eppley SMT Tracker), the preferred FOV for pyrheliometers is now 5º. The new Eppley sNIP has a 5° FOV. In fact, it has the exact same geometric dimensions as used in the AHF. Additionally, internal changes were employed to increase the response time and reduce conduction and convection issues and a thermistor is included for those who wish to measure the instrument temperature. As a result, the new Normal Incidence Pyrheliometer, Model sNIP meets the performance specifications of an ISO Secondary Standard* and a WMO High Quality Pyrheliometer.